Sunset and Tim Boxell’s Valley of the Heart’s Delight. and with a public intent on lynching. festival, which will be running from June 7 through the 15.
for schedules, film synopses, and film stills. the stars of these independent films. cultural experience for its audiences. world who dare to express themselves in new, unique and imaginative ways. animation as well as its outstanding roster of feature films. 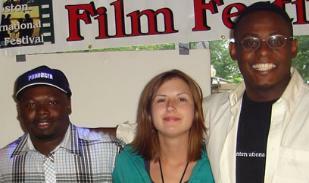 visit the web site: www.bifilmfestival.com . To reserve your tickets now call 617-742-3500, or purchase your tickets on line. were cited for their outstanding achievements. beginning June 24th through June 27th 2004.
themselves in new, unique and imaginative ways. France, Japan, Brazil, England, Namibia, the United States, etc. filmmakers who manage to illustrate their independent vision at the finest level of expression. via e-mail: bifilmfestival@aol.com, or Phone 617-426-4600 / 781-935-0871.
starting June 24th through the June 27th of 2004.
express themselves in new, unique and imaginative ways. will take place at the following locations. John Hancock Hall; 180 Berkeley Street, Boston Back Bay/Copley Square area. Bill Bordy Theater; 216 Tremont St. Boston, MA 02116.
via e-mail: info@bifilmfestival.com, or Phone 617-426-4600 or 781-935-0871.
International Film Festival Starting July 3rd through the 5th of 2003.
theJohn Hancock Hall located at 180 Berkeley Street Back Bay/Copley Square area. together filmmakers and moviegoers from around the world. vision at the finest level of expression. ANIMATED FILMS FROM ALL OVER THE WORLD, AS WELL AS GUEST FILMMAKERS. S THIRD FILM, “HOLLA AT ME,” WHICH JUST PLAYED THE TRIBECA FILM FESTIVAL IN NEW YORK. JEROME, WHO IS FINALIZING THE SCHEDULE FOR POSTING ON THE FESTIVAL’S WEBSITE. BEEN A GOOD REPRESENTATION OF INTERNATIONAL FILMS AT FESTIVALS HERE,” SAYS JEROME. DOESN’T SHOW UP FOR OTHER FILM FESTIVALS.” FOR MORE INFORMATION, VISIT WWW. International Film Festival July 3 through 5.
trade in Southeast Asia had been rejected from numerous festivals due to its controversial topic. filmmakers in an environment that brings all cultures together. introduced each Q&A session with a terrific sense of timing and polish. Dahli Llama”. It now goes directly to national distribution. and well done films.” The quality as well as quantity of submissions was overwhelming. it to be produced in time to screen this year. them think our landing on the moon is a myth! was about to give birth at home, but his many other siblings were present to support him. Rebekah Chaney was one of the most interesting I have ever attended! can say is don’t miss this festival next year! contest, or just learn more about the event, go to the festival’s website, http://www. fashioned to say - I had a blast. director was visible, available and involved. passion and unique visions of the filmmakers in an environment that brings all cultures together. This year's festival will screen over a hundred short and feature films from six continents. struggling to survive on the streets of South Boston. stars Matt Dillon and Angela Bassett. theater, Boston Common: 175 Tremont St, Boston, MA. Theatre in Boston Common on Sunday, April 26, 2009.
to the diverse Boston community. South Africa, Spain, Thailand, Tibet, UK, Venezuela, and USA. For more information and a complete schedule, you can visit our website at www. 175 Tremont Street for the occasion. dazzling variety of both short and feature length films from a select group of directors. countries including Brazil,Haiti, Nigeria, South Africa, and Tibet to name a few. five minute sizzling bedroom drama written and directed by Guy Taylor and Dan Boylan. ANA'S PLAYGROUND follows, an intense tale written and directed by Eric D.
Howell, which transports us to a day in the life of children living amidst armed conflict. day and guns run the streets. sessions. The Closing Gala party at 8:30 wraps up the event for the season. the AMC/Loews Theatre in Boston Common on Sunday, April 25, 2010.
open and close this year’s edition. Mariel Hemmingway and Steve Gutenberg. the day a soldier walks uninvited into her kitchen and tells her to pack a bag. Wilson, the film stars Natasha Petrovic as Samira. office to arrange for a personal interview with these visiting filmmakers. 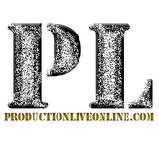 filmmakers, and promises to both entertain and educate the viewers. 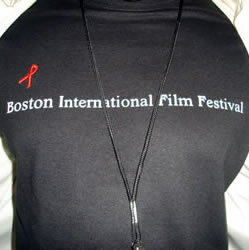 Boston International Film Festival, running from April 15 through April 24, 2011.
promises to both entertain and educate the viewers. on hand to greet the stars as they walk down the red carpet and enter the theatre. festival, as well as information about purchasing tickets can be found online at www. 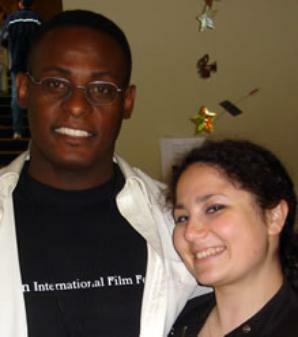 over 100 short and feature length films from more than 30 different countries. proximity to the AMC/Loews Theatre across from the Boston Commons. Screening Session 14, to be held on Monday, April 18, is dedicated entirely to Haiti. most devastating international event of our time. Ibrahim brings Jessica, his American love, and her family to stay in this remote village. stars Kathie Gill, Mariel Hemmingway and Steve Gutenberg. by Juanita Wilson, the film stars Natasha Petrovic as Samira. screened at the festival can be found on our website www.bifilmfestival.com. all of the 42 screening sessions costs $75. This year we will be screening over 100 short and feature films from 30 countries. Common on Sunday, April 24, 2011. Common on Sunday, April 22, 2012.
countries at the AMC/Loews Theater, 175 Tremont St. in Boston Common. The Boston International Film Festival is a celebration of the art of filmmaking. Spain, Taiwan, Turkey, United Kingdom, United States and more. sessions, each of which includes one or more short films, followed by a feature. audience is invited to ask the filmmakers questions. childhood friends who find themselves on both sides of the law. hand to greet the stars as they walk down the red carpet and enter the theatre. with the lingering factions of the Taliban. attendance. Noah Bean from "Black Marigold" will also be on the red carpet. A limited number of press passes are available. to inquire about press pass availability. entertain and educate the viewers. tragedy that occurred here in our Boston home. with the hopes that celebrating film will offer a positive experience in this difficult time. by commiserating and thinking of all those who have suffered. and we hope that we can offer a venue to begin the healing process. 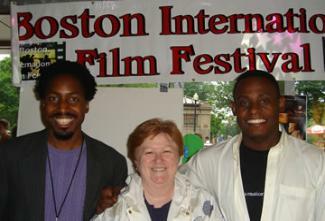 11th Annual Boston International Film Festival. as we were forced to cancel a number of screenings. Common on Sunday, April 21, 2013. Kristyn Ulanday & Max Esposito for "THE DRUID CITY"